I hope everyone's season has been full of friends, family, fun, and of course lots of delicious food! I was lucky enough to spend the last two weeks traveling around southeastern Australia, which lent itself to a lot of diligent research on all things sweet down under. Amidst a vast array of tasty treats (including heaps of Tim Tams and Caramello Koalas) there was a particular stand out which I found especially inspiring and knew I had to share with all of you in case you find yourself even remotely within its vicinity. 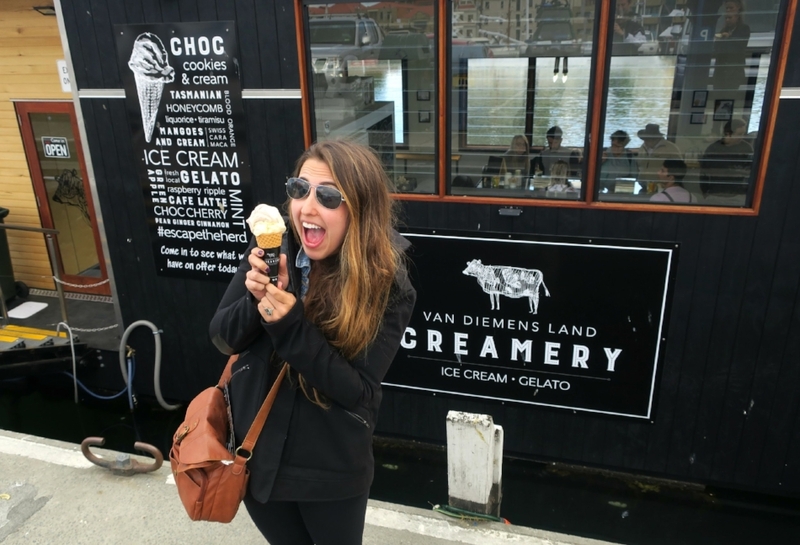 Van Diemens Land Creamery is an ice cream and artisan gelato company on the island of Tasmania (formerly known as Van Diemens Land, hence the name!) specializing in delicious smile-inducing flavors. Established by a dairy-farming family in 2005, they now have their original location in northwestern Tasmania, their "punt" (dockside outpost) in capital city Hobart, and their product in stores and restaurants all around the state (which is actually only about the size of West Virginia). Their adorable cow-adorned Hobart location (which opened just this past October) immediately grabbed my attention when I spotted it on Constitution Dock while waiting for my dinner from a nearby seafood punt. Their unique flavors were displayed on a large graphic outside and I immediately knew which I wanted to try... Pepperberry & Leatherwood Honey. At the time I didn't even know what either of those ingredients were, but that made them all the more exciting! However, much to my dismay, I realized that the shop had closed just four minutes prior to my arrival. To make matters worse, I wasn't scheduled to return to Hobart until Christmas eve... and I knew there was a good chance they wouldn't be open for the holiday! Crushed (I genuinely could not have looked more pathetic) I just stood outside lamenting my misfortune like a sad puppy dog. What if I never got to learn what the hell a pepperberry is?! The next morning I embarked on a clockwise tour around Tasmania, which was heavily peppered (pun super intended) by attempts to track down some VDL Pepperberry & Leatherwood Honey. During my travels, I learned that pepperberries (also known as Tasmanian Mountain Pepper) are native only to the island and have a fruity and floral flavor with an aftertaste similar to black peppercorns. I also got to taste Leatherwood Honey, which likewise is only cultivated in Tasmania, and has an interesting spicy and almost musky flavor. Getting a better sense of the components only deepened my desire to try that ice cream! My curiosity was finally partially satisfied at a visit to Hellyer's Road Distillery where the dessert menu featured Van Diemens Land Creamery's Pear, Cinnamon, & Ginger and Caramelised Fig ice creams topped with crumbled ginger bread. I decided that I had to go for the especially seasonal combo (despite it being summer in Australia) just to get a sense in case I'd indeed missed my opportunity to visit an actual VDL location. The flavors were bright, fruity and well spiced... and the texture was awesomely smooth with the perfect amount of richness. Now that I'd sampled not only the featured ingredients but also the ice cream base, I was even more eager to get my hands on Pepperberry & Leatherwood Honey! Pepperberry & Leatherwood Honey and Peach Lemon Myrtle ice creams from Van Diemens Land Creamery at last! Thankfully, my wish was finally granted on Christmas eve when we rolled into Hobart shortly before the punt's early holiday closing time. Phew! I gleefully selected Lemon Myrtle & Peach to accompany my ride or die selection, since I had also learned that lemon myrtle is a fairly uniquely Tasmanian ingredient (plus how often do we get to eat peaches, which are the best, in LA in December?). Ultimately, the wait was totally worth it. Pepperberry & Leatherwood Honey is a true match made in heaven. The spiciness of the honey worked perfectly with the pepperiness and floral notes from both ingredients. Not only was I super satisfied, but I was also incredibly inspired. Since Van Diemens Land Creamery had found great success highlighting such genuinely Tasmanian ingredients, I started to think about how we at The Pudding Truck might get inspiration from all that Los Angeles and its surrounding areas have to offer. What do you think? What are some flavors or ingredients that you think scream Los Angeles or California? Think any of them would make a great pudding flavor or topping? And furthermore, we in LA have some excellent creameries killing the funky flavor game too! Which are some of your favorites? If you're at all curious, check out Van Diemens Land Creamery at http://www.vdlcreamery.com.au/ or on Instagram at @vdlcreamery!